Protesters in a demonstration against the Constituent Assembly. 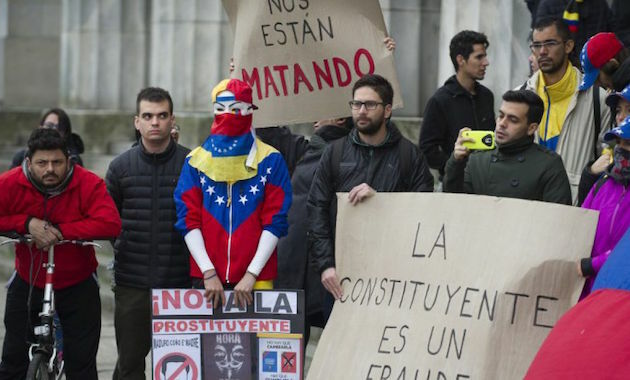 The implementation of the Constituent Assembly in Venezuela and its first decisions have once again raised criticism in the international arena and sows bewilderment throughout the country. One of the last issues that the European Union has pointed out in a statement published this Monday, has been the dismissal of the Attorney General, Luisa Ortega. International organizations like Mercosur have also criticized the Venezuelan political situation. The Attorney General of Brazil, Argentina, Paraguay, Uruguay, Chile and Peru have issued a document "vehemently rejecting the dismissal of the Attorney General of Venezuela and urging the international community to adopt immediate measures to promote the reconstitution of the constitutional order." Meanwhile, tensions and violence continue in the streets throughout the country. .
Several evangelical churches and organiations in Venezuela have shown their willingness to work for peace in the country. The majority have rejected the Constituent Assembly of Nicholas Maduro, as well as the Vatican, which asked for its suspension. The Latin Evangelical Alliance (AEL in Spanish) has expressed "its pain and condolences to relatives and friends of the victims in the midst of the acts of violence that took place in the sister Bolivarian Republic of Venezuela. Far from any political or ideological connotation, we repudiate the continuous confrontation between Venezuelan brothers." The AEL has "called the Latin Evangelical churches to renew your prayers for the Venezuelan people and the crisis that this beloved nation is suffering, so that, in the midst of all this complex situation, the Venezuelans can turn to God, repudiating all kinds of evil and violence." They have also asked the authorities and the different social actors of the country to "seek in God the source of all reason and justice, the wisdom that will allow you to find the ways to restore the order and the social justice in Venezuela." “May God guides you clearly", they conclude.